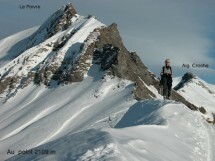 My friend Jean organizes a winter hike on the Pointe Orsière from Manigod (60 km from Geneva) this Saturday, February 6th. A very beautiful track joins a ridgeline. Beautiful view of the Manigod Valley and the entire southern part of the Aravis and the peaks of the Bauges. Point of Orsière culminates at 1750 m.
This hike, originally scheduled Sunday moved to Saturday, due to better weather. A gradient of 800 m and a distance of 10 km. Walking time: about 4 hours.